Starwood’s diverse portfolio in Asia boasts several record-setting properties including its highest, largest and tallest hotels. The soon-to-open, 100-story The St. Regis Shenzhen tops the charts at 441 meters. Starwood’s most highly elevated hotel is The St. Regis Lhasa, perched on the Tibetan Plateau, and its largest property is the nearly 4,000 room Sheraton Macao Hotel, Cotai Central located on the Cotai strip – the “Las Vegas” of Asia. China will play an outsized role in global travel within the next decade as one of the world’s fastest growing travel markets, with 100 million outbound travelers expected by 2015. Starwood now has 86 hotels open in China and nearly 100 more in development and expects to open one hotel in China every two weeks through the end of 2011. Nearly half of Starwood’s future hotels in China will fly the Sheraton flag, building on the brand’s 30-year legacy in the country, which has paved the way for robust growth across Starwood’s other world-class brands. 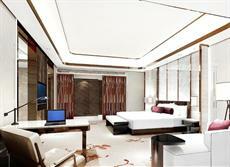 India is now Starwood’s fourth largest market and a close second to China in terms of future hotel development. Starwood now has more four and five star hotels than any other hotel company in India, where it expects to open its 50th hotel in 2013 and have 100 hotels either open or in development by 2015. Starwood also announced earlier in the year the signing of the first W in India – W Mumbai, followed by the recent signings of W Noida and W Goa Retreat. With the introduction of W Hotels as well as the entry of the first St. Regis in India with St. Regis Noida, eight of Starwood’s nine brands will fly their flags in India including W, St. Regis, The Luxury Collection, Le Méridien, Westin, Sheraton, Four Points by Sheraton and Aloft. Starwood is experiencing robust demand in many of Asia’s other fast-growing economies including Thailand, Malaysia and Indonesia. Following the recent opening of Four Points by Sheraton Resort Langkawi, Starwood will grow 30% in Malaysia in the next three years with plans to open another four hotels including Four Points by Sheraton Sandakan, Sheraton Desaru Resort, The St. Regis Kuala Lumpur and W Kuala Lumpur. In Indonesia, Starwood will add another four hotels by 2012 to its current portfolio of 12 properties. With the opening of Aloft Bangkok Sukhumvit 11, Thailand will be the first country in the South East Asia region to have eight out of nine Starwood brands. Today, Starwood has a robust footprint of 18 hotels in Thailand with another six openings planned by 2014.